Mansory, the tuning house with a penchant for ruining nearly everything it touches, may have finally made something cool that doesn't burn out people's retinas. The car, called the Carbonado, is a carbon fiber Lamborghini Aventador that will be limited to a production run of just six units. Mansory says they have added carbon fiber aerodynamic bits to the car and have managed to make the already massive Aventador even wider. Add in massive 20- and 21-inch wheels, and the whole package comes together in a large but beautiful away. The Carbonado also has more power. 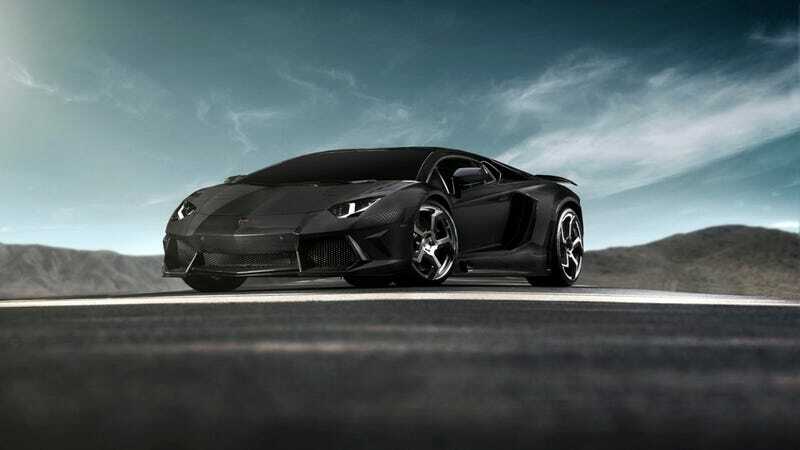 While the standard Aventador comes with an already stout 691 horses, the upgraded Carbonado has 754 metric horsepower, which is equivalent to 744 of our own red-blooded, American horsepowers. The price is going to fall somewhere between "if you have to ask" and "more money than God" plus the price of a donor Aventador. You'll probably have to sell your soul to get one, Dr. Faustus, which is fitting since it looks like the devil's own steed.